The power output from large megawatt turbines and comparisons with WindPower predictions. 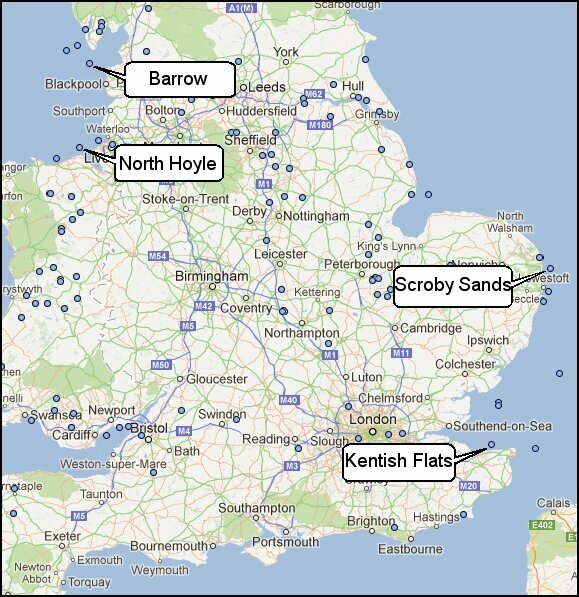 - Kentish Flats, Barrow, North Hoyle and Scroby Sands. Summary This webpage compares the mean power predictions of the WindPower program with field data for large wind turbines -the Vestas V90 and V80 turbines - obtained from reports on the performance of four offshore wind farms. The results show that the method used by the WindPower program for calculating mean power - set out in webage 16 - gives a good fit to the field data. This webpage also discusses the general performance of a number of offshore wind farms based on a series of reports that are available from the Department for Energy and Climate Change website (http://www.decc.gov.uk/). They can also be downloaded from our library page. Two significant points from the reports are to be noted. The first is that the planned operational turbine availabilities of 90% or more are not achieved in the first year or so of operation due to significant reliability issues - mainly with gearboxes. But, there is evidence that reliability improves in later years and that the wind farms start to approach their planned performance with capacity factors of 35% or more being achieved. The other operational point is that with a spacing of around eight rotor diameters between the turbines, there is no evidence of wake effects of the upstream turbines affecting the mean power outputs of the downwind turbines. Some financial data on the capital and maintenance costs are also given that is used in webpage 19 on the cost of large-scale wind generated electricity. The Kentish Flats wind farm in the Thames estuary started operating in 2006. It is sited about 8 kilometres off the north Kent coast and uses thirty Vestas V90 3 megawatt offshore wind turbines. The figure below shows the grid layout of the thirty turbines plotted on the Ordnance Survey grid system of easting and northings in metres measured from the Ordnance Survey reference position just to the south west of the Scilly Isles. The distance between the turbines on the grid lines are 0.7 kms although one or two turbines are not quite on the grid lines - A3 and C3 for example. This was probably due to some local sea bed conditions that required that they be placed not quite regularly. With a turbine rotor diameter of 90 metres, the spacing between the turbines along the grid lines is just under 8 rotor diameters. The figure below shows the monthly average wind speeds for 2007 and 2008. The general reduction in wind speeds during the summer months is clearly discernible. The annual mean wind speeds are all less than the long term expected wind speed of 8.7 metres/sec at the hub height of 70 metres. 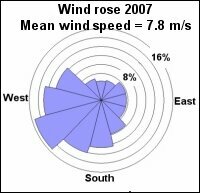 The figure below shows the 2007 windrose for the site. It shows that the predominant wind direction was roughly west-south-west. In 2008, the predominant wind direction was a little more westerly. 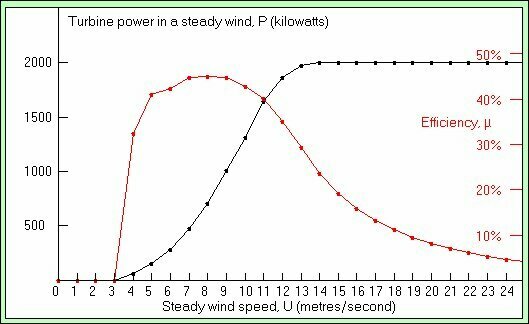 Turbines F1 to F5 are thus generally the most leeward turbines and one of the aims of the data analysis below was to check if a lower average power output could be detected in this turbine row. 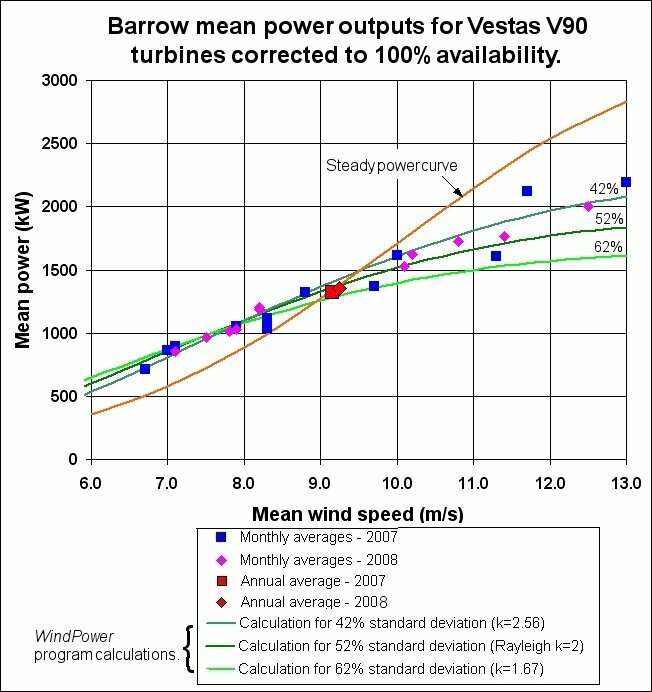 Steady power and efficiency curve for the Vestas V90 3mW turbine (109.4 dBA). The figure below shows the power curve and efficiency curve of the Vestas V90 offshore wind turbine taken from the WindPower program. These turbines are IEC IIA rated which means they are designed to operate in medium speed winds of around 8.5 metres/second. The peak efficiency is close to 45% and the design achieves this efficiency in the range from 8 to 10 metres per second. Comparison of mean power outputs with the WindPower program estimates. The DECC reports on Kentish flats give tables of the monthly energy output in mW-hrs for each turbine and their monthly availability. For the two years 2007 and 2008, this amounts to 720 monthly energy figures but only 84 of these are turbines with 100% availability for the whole month. Thus, in order to improve the accuracy of the mean power estimates, the energy figures for all turbines with an availability equal to or greater than 90% were selected. This amounted to 483 data points. The monthly mean power of each of these turbines was simply given by the energy output divided by the number of hours in each month and the availability. Results below 90% were excluded as the wind speeds on the number of non-available days would make the mean power estimates increasingly less accurate. The 90% limit was rather arbitrary but it meant that reasonable accuracy was assured and a much larger number of data points were available to obtain accurate mean power estimates. The figure below shows a comparison between the mean power calculated from the WindPower program and the field data with availabilities greater than 90%. The results for the annual mean power outputs are also shown. There is some scatter in the results particularly at the higher mean wind speeds which probably reflects the fact that there is a significant variation in the probability density distribution of the wind speed from month to month. Mean power estimates from the WindPower program are shown for three values of the wind speed standard deviation (or Weibull factor). Generally speaking, the results seems to scatter rather better around mean power results calculated using a standard deviation of speed compared to the mean speed of 52% - the Rayleigh distribution. 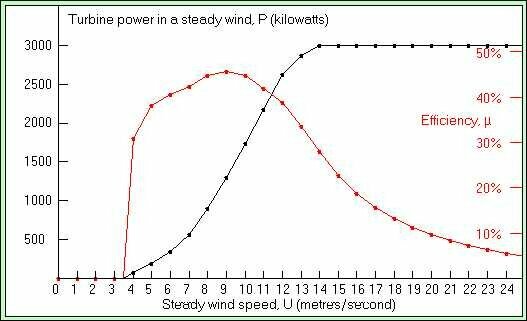 It is worth noting that if the expected annual mean wind speed of 8.7 metres/second materialises then the calculated 100% availability mean power of each turbine would be 1,243kW giving a capacity factor of 42.1%. If the operational availability of 90% is achieved and 3% transmission losses are allowed for, the capacity factor would drop to 36.8% but this greatly exceeds the current overall capacity factor of wind turbines in the UK. The figure below shows the annual energy production up to more recent times obtained from data on the Renewable Obligation Certificates (ROCs) that are issued for every megawatt-hour of energy produced. The data is obtained from the excellent Green Generator Database on the website www.ref.org.uk. No data is available on the mean wind speeds for more recent years but it does appear that reliability issues are being dealt with and, in common with other data, there does seem to be an upward trend in the performance of off-shore wind farms. 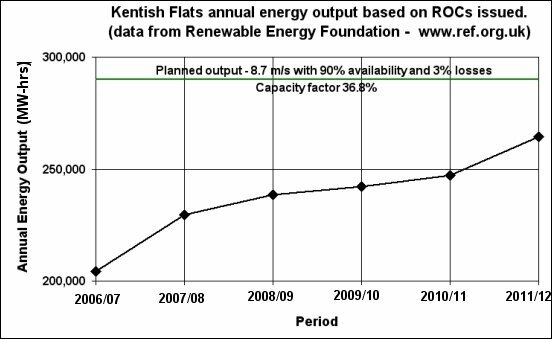 Kentish Flats project costs, operating costs and turbine availability. In the 2007 report, the overall project cost is given as £105,000,000 or £3,500,000 per turbine. If we take the capacity factor - the ratio of the mean power to the rated power output - to be 1/3 then the mean power output per turbine is 1 mW. If the turbine reliability eventually enables the turbines to operate for 90% of the time then the capital cost per deliverable megawatt of power is £3,900,000. This is very close to the performance achieved in the third year of operation (2008) and it will be interesting to see if this has been maintained or even improved in the times since. However, reliability is clearly a major issue because all thirty gearboxes were replaced in 2007 along with refurbishment of half of the generators. Further gearbox and generator upgrades to all the wind turbines were planned for 2008. It should be noted that there are a number of large wind turbines that have eliminated gearboxes altogether by using a many-poled annular generator (e.g.Enercon, Siemens) but these seem as yet to have no higher reliability than turbines with gearboxes (see Tavner, Spinato, Bussel and Koutoulakos (2008), Reliability of Different Wind Turbine Concepts with Relevance to Offshore Application, European Wind Energy Conference, Brussels - available from our library page). Ratio of mean power from row A to row F - wake effects? The effect of the wake of wind turbines on other units downstream from them is an important issue in wind farm design. It is not only the effect on the power output that is of interest but also on the reliability of downstream turbines - since they are in a more turbulent flow environment than the upstream units. As far as the power effect is concerned, it is interesting to look at the mean power output of row F as compared to row A. From the windrose, row F would seem to be more often the downstream row. The figure below shows the ratio of the mean monthly power of the turbines in row A compared to those in row F as a function of monthly mean wind speed - only using turbines with availabilities of greater 90%. The figure only uses the 2006 data and shows no obvious effect of row position. The average ratio is 1.03 but this is not statistically significant. There have been suggestions that the effect of the wake may cause downwind turbines to produce up to around 60% less power but there is no evidence of this in the present results. On the contrary, no obvious difference of any magnitude in the output from turbine to turbine can be discerned in the present results. 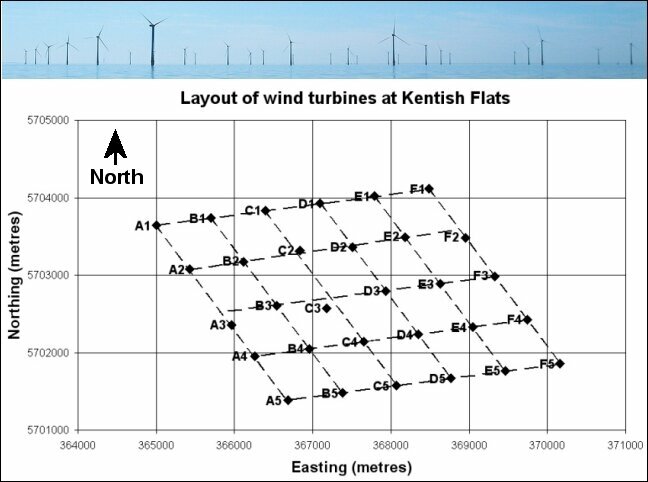 The orientation of the grid with respect to the prevailing wind direction is clearly an important aspect of wind farm design and, in the case of Kentish flats, no effect of the position of the turbine row can be detected. THE BARROW WIND FARM - 30 VESTAS V90 3MW TURBINES. This offshore wind farm is about 8 kilometres southwest from Barrow-in-Furness. It consists of 30 turbines arranged in four rows with alternating 7 or 8 turbines per row. 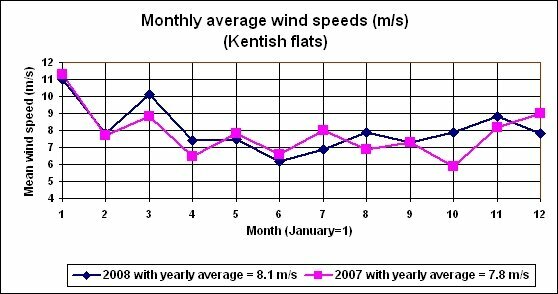 The long-term mean wind speed at the site is 9.2 metres/second so that it is a somewhat windier site than Kentish flats. As with the Kentish flats wind farm, the turbines suffered from significant reliability problems in the first two years of operation and, of the 720 monthly energy ouptut figures, only 56 of the outputs arose from turbines that had 100% availability for the whole month. However, 351 of the monthly figures arose from turbines that had availability figures of 90% or more and the figure below shows a comparison between these monthly average power figures and the predictions of the WindPower program. 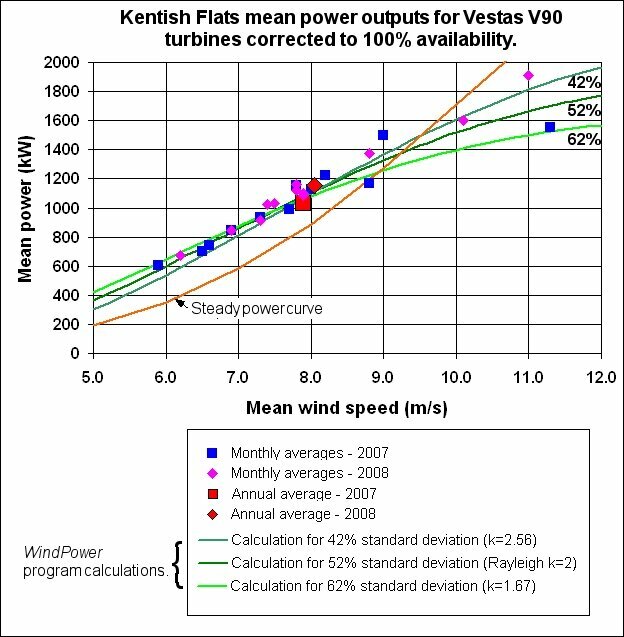 The results are very similar to those obtained for the Kentish Flats wind farm although there are five monthly data points for mean wind speeds above 11 metres/second compared with just two for Kentish Flats. Once again, the scatter on the data is such that there is no clear best fit against the wind speed standard deviation - although the wind speed data at mean wind speeds above, say, 10 metres/second does seem to fit the 42% standard deviation curve rather better than the 52% and 62% curves. 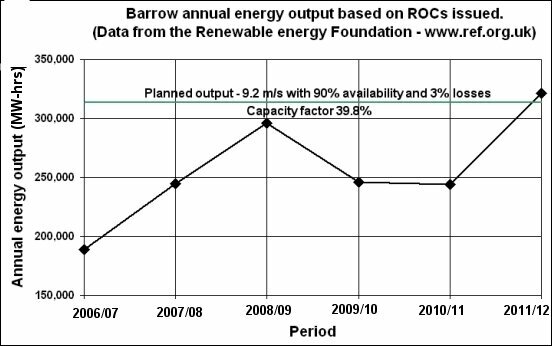 Barrow project costs, operating costs and turbine availability. The table below gives the project costs, operating costs and availability data for the Barrow wind farm. 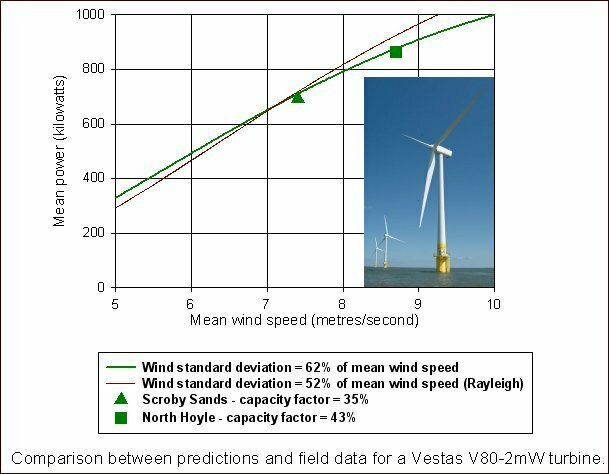 SCROBY SANDS AND NORTH HOYLE WIND FARMS - 30 VESTAS V80 2MW TURBINES. There are also reports on earlier wind farms using the Vestas V80 2 megawatt offshore wind turbine. One of them is produced by E-ON (UK) on the performance of their offshore Scroby Sands wind farm off the Norfolk coast and the other was produced by Npower Renewables Ltd on the offshore North Hoyle wind farm off the North Wales coast. Both reports cover an operating period of a year - 2005 for Scroby Sands and 2003-2004 for North Hoyle - and they are both available from our reference library page. The table below lists the important results. More recent reports have been released but the data in them does not add anything significantly to the analysis of the data on the first year of operation. The figure below shows the steady power curve and turbine efficiencies for the Vestas V80 offshore wind turbine. The figure below shows a comparison between the predictions of the WindPower program and the field data for just the mean power results for a year. The mean power output has been calculated for the default value of the standard deviation of 62% and also for the Rayleigh distribution of 52%. The agreement between the field data and the WindPower predictions is good. It should be stressed that the mean power output for the Vestas has been calculated for the period when they were fully operational. Once again, the percentage time for the turbines to be operational was below the 90-95% much above 85% - data obtained since these reports continues to show about an 85% operational level. It was apparently hoped that this figure would have been closer to 95%. Next, some comments on the performance of small wind turbines.